If you’re a frequent Amazon shopper then I kindly ask you to consider two things. If you’d like to support RPadTV then kindly go to Amazon through this link. If you’re interested in supporting a number of different charities through your purchases then check out Amazon Smile. It’s a great initiative that gives 0.5 percent of the revenue from your eligible purchases to the charity of your choice. 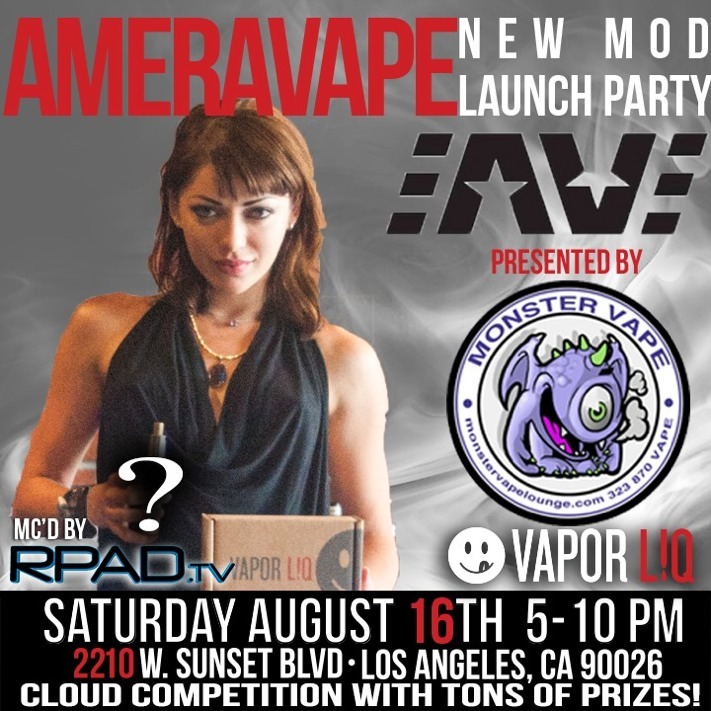 I’m hosting a hardware launch at Monster Vape Lounge for some new AmeraVape Industries mods. There will be a cloud contest with a sweet grand prize, as well as hardware and juice giveaways throughout the day. It’ll be a great time, full of excellent people and free vaping stuff. Hope to see you there! Amazon Pre-Black Friday Madness is On! If you’re looking for a way to snag some sweet deals and support RPad.TV then kindly hit the banner above for Amazon’s “Countdown to Black Friday” deals. Every day, Amazon will post rolling “Lightning” deals. There are some great savings to be had, whether you’re looking for videogames, consumer electronics, clothing, tools, appliances, and more. Please be sure to check the site every day to see if there are any pre-Black Friday deals you can take advantage of. If you happen to snag something, kindly share your loot in the comments section. As for me, daddy needs a new all-in-one printer. Unfortunately, the one currently on sale doesn’t play nice with Mac OS X Mavericks. Am cry. Anyway, good luck with your deal hunting! Author RPadTVPosted on November 15, 2013 Categories PSATags PSA3 Comments on Amazon Pre-Black Friday Madness is On! My buddy at CuteMonster is having a contest for the super-cool KRE-O Strek Trek USS Enterprise Construction Set. Since many of you are Star Trek nerds and you should all be LEGO nerds, this is something you should enter. (And yes, I know this is a KRE-O toy and not a LEGO toy, but I’m using LEGO the same way many people use Coke as a general term for soda.) This Star Trek toy is totally cool! I’d love to win one for the price of free. I wonder if you can buy extra packs of red-shirted Starfleet officers to use as fodder…. Awesome iOS Games For Free! To celebrate the five-year anniversary of the App Store, a number of excellent apps are free for a limited time. The freebies include some incredible games for your iPhone, iPad, or iPod Touch. Badland, Infinity Blade II, Superbrothers: Sword & Sworcery EP, Tiny Wings, Tiny Wings HD, and Where’s My Water can be had for a grand total of $0.00. Go download them now! Notable non-gaming freebies include Barefoot World Atlas and Traktor DJ. If you come across any other fine iOS freebies, kindly post them in the comments section. Author RPadTVPosted on July 8, 2013 July 8, 2013 Categories iPhone, PSA, VideogamesTags iPhone, PSA, Videogames1 Comment on Awesome iOS Games For Free! PlayStation Network’s Summer Blast Sale starts tomorrow and there are some great discounts to be had — especially if you’re a PlayStation Plus member. Check out the list below and leave a comment on the games and movies you’re thinking about picking up. Sony Computer Entertainment America is holding a sale for the winners of the 2013 PlayStation Network Gamers’ Choice Awards. There are some fantastic games available at great prices, especially if you’re a PlayStation Plus member. Here’s a sampling of what can be nabbed by you bargain hunters out there. Hit the source link below to see all the games that are on sale. If you happen to pick anything up, please let me know. I know that most of you don’t have Vitas, but if you do then you should definitely pick up Gravity Rush. It’s a sweet game and available for free! Are you looking to buy yourself a Christmas (the commercial holiday, not the religious one) present, but are short on cash? If so, then you’ll be happy to learn that there are four iOS games that are free for a limited time. The first chapter of Walking Dead: The Game is sure to scare you, as well as vex you with some tough decisions. Avengers Initiative is a fun brawler that stars Captain American and The Incredible Hulk. ARC Squadron is a space shooter that boasts some really impressive graphics. Last, but probably the most appropriate for this time of the year, is Santa Rockstar, which is a Rock Band-style game featuring Kris Kringle. Check out the iTunes descriptions to see how long these games will be free for (or just download them now). If you happen to pick up any of these freebies, please let me know what you think of them in the comments section. If you happen to pick anything up, please leave a note in the comments section. Extra-special thanks goes to everyone that takes advantage of these deals through the Amazon links above. Starting today, Square Enix is having a sale on its iOS games. There are some real gems for old-school RPG fans, including one of my favorite games of 2012 — Final Fantasy Dimensions. Check out the sales list and dates below. If you pick anything up, please leave the details of your booty in the comments section.